Washington, George (1732-1799) Document, Twice Signed, 25 January 1774. 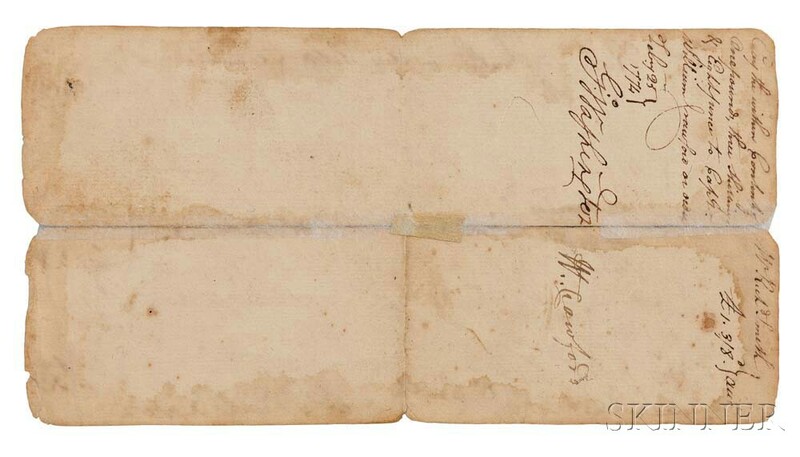 Single leaf inscribed and signed by Washington on both sides, billing Richard Smith for a survey of land granted to him for his service in the French and Indian War; fragmentary along folds, repaired, light soiling and dampstains, 8 x 4 1/4 in. "Mr. Richard Smith, on account of his claim to land under the Proclamation of 1754. This Proposition of the expence of exploring, surveying, patenting, and other incidental charges attending the grant of 200,000 acres of land under the Proclamation aforesaid; his part per order of council being 500 acres on the Sundry Creeks, in a Patent for 28,627 Acres. May 1st 1771 Contra Cr: 1.1 By Cash 1.3.8." Signed and dated by Washington 25 January 1774. Signed again by Washington on verso, docketed, signed by Captain William Crawford (1722-1782). On the 19th of February, 1754, to encourage prompt enlistment of a sufficient force to build and hold a fort at the head of the Ohio river (Fort Prince George), Governor Dunwittie of Virginia promised a share in 200,000 acres of British lands on the east side of the Ohio river to enrolling soldiers over and above their legal pay. The portion of land awarded was dependent on rank. Washington visited the land himself, supervised its surveyal, and portioned out the lots. This particular receipt concerns the land awarded to Richard Smith, a corporal who enlisted with the Virginia Regiment on 23 April 1754. He is described on the muster rolls as 23 years of age, 5' 7 1/2" tall, of Princess Anne County, swarthy, planter, fair face, well made. Corporal Smith served in Captain Robert Strobo's Company, and was at Fort Necessity. Washington's correspondence mentions a Richard Smith as a Cherokee Indian interpreter, and in Lloyd DeWitt Bockstruck's Virginia's Colonial Soldiers, he notes that Smith served as an interpreter under the care of Bullet at Fort Chiswell on 17 January 1764.